The Earth at night. From nasa.gov. Unfortunately for the citizens of the State of New York, the “Healthy, Safe and Energy Efficient Lighting Act,” designed to curb the excessive and misdirected outdoor lighting in public applications (street lights, especially) that has increasingly degraded our night skies, has failed for this legislative session. The session ended on Thursday, 6/21/07. Opposition from a variety of groups, including the NY Farm Bureau (which also successfully opposed legislation to limit open burning and burn barrels in the State) and the NY Council of Mayors (NYCOM), seemed to have played a major role. Thanks to those who wrote in support of outdoor lighting regulation. Be aware, however, that until we can gain a critical mass of consistent and vocal support for such bills in order to overcome the organized and well-funded opposition to a statewide initiative to reduce light pollution, we will see the continued degradation of the night skies all around us. PURPOSE OR GENERAL IDEA OF BILL: This bill provides for the management of outdoor night lighting to protect the nighttime environment, enhance safety and security, and conserve energy. SUMMARY OF SPECIFIC PROVISIONS: Section 1 adds a new Article 20 to the environmental conservation law, the Healthy, Safe and Energy Efficient Outdoor Lighting Act. Article 20 includes sections 20-0101 setting out legislative findings, section 20-0103 stating a short title, section 20-0105 defining terms, section 20-0107 on permanent outdoor lighting, section 20-0109 on dark-sky preserves, section 20-111 requiring the Department of Environmental Conservation (DEC), in consultation with the New York Energy Research and Development Authority (NYSERDA) to develop and distribute a model comprehensive outdoor lighting ordinance, section 20-0113 requiring DEC, in consultation with NYSERDA to develop and distribute a pamphlet promoting the bill’s goals of energy conservation and more effective night lighting and describing how the provisions of this bill will achieve them and section 20-0115 on applicability. Section 2 directs the Public Service Commission to require that every electric corporation or municipality providing electric service include the educational pamphlets in its bills to customers. Section 3 sets out the effective date. JUSTIFICATION: This bill is intended to limit excessive outdoor illumination. Excessive illumination wastes energy, intrudes on the privacy of others, creates glare which reduces the effect of lighting, deteriorates the natural nighttime environment, and reduces the ability for astronomical observation. Outdoor lighting is used to illuminate roadways, parking lots, yards, sidewalks, public meeting areas, signs, work sites and buildings. When well designed, it improves visibility, adds an element of safety and creates a sense of security, while at the same time minimizing energy use and operating costs. If, however, it is not well designed it can be costly, inefficient, counterproductive, and harmful to the nighttime environment. Much of the outdoor lighting in use today wastes energy because it is poorly designed. This waste results in both higher costs for providing such lighting and increased pollution from the power plants that produce the wasted electricity. It is conservatively estimated that $3 to $4.5 billion a year is wasted in the United States in the unintended lighting of the sky rather than the streets, walkways, and outdoor public spaces which the light was intended to illuminate. In addition to wasting energy, poorly designed lighting often causes blinding glare. Glare occurs when you see light directly from a fixture or bulb. The glare from poorly designed or positioned lighting hampers the vision of drivers and pedestrians, reducing its effectiveness and creating a hazard rather than increasing safety. It shines onto neighboring properties and into nearby residences, reducing privacy, hindering sleep, and diminishing the beauty of the natural surroundings in areas far removed from the source of such lighting. 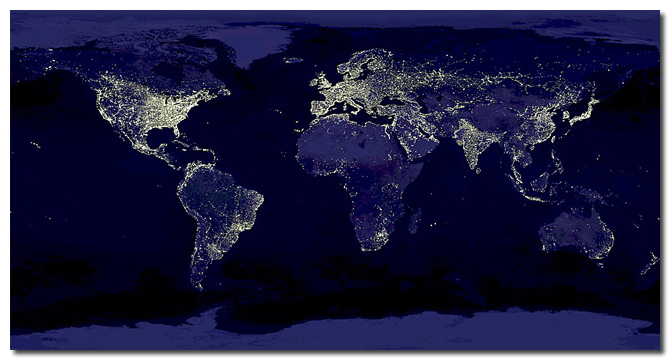 A large portion of such lighting shines directly upward, creating the sky glow above population centers, adversely affecting the view of the night sky. In addition to lowering the cost of outdoor lighting, limiting sky glow will allow future generations to enjoy the beauty of the stars, and to study and learn from or simply marvel at the wonders of the night sky. * It restricts the installation of new lighting by state agencies or public corporations operating in the state to fully-shielded luminaries. A fully shielded luminaire is constructed and installed in such a manner that all light emitted by it is projected below a horizontal plane through the lowest light emitting part of a light fixture. * It exempts replacement of luminaires that are part of a continuous roadway lighting design from the requirement that only fully shielded luminaires be installed by state agencies and public corporations. * It allows the chief executive officer of any state agency or public corporation to exempt the state agency or public corporation from the requirement that it install only fully shielded luminaires, based upon a written determination by the chief executive officer that a compelling safety interest requires that other types of lighting be installed. * It exempts tunnel, airport, underbridge, traffic control, navigational and natural and cultural monument lighting from the requirement to install fully shielded luminaires. * It exempts historic-style decorative lighting if the installation of fully shielded luminaires detracts from the aesthetic character of the existing lighting. * It allows historic-style decorative lighting to emit up to two percent of its lumens above the horizontal plane. * It requires the commissioner, in consultation with NYSERDA, to develop luminaire efficiency and lamp luminous efficacy standards by the effective date of the legislation and requires that these standards take effect 180 days after the effective date of this legislation. * It requires that the department in consultation with NYSERDA report to the legislature on technological advances that affect the provisions of this article and recommend amendments to this article which would increase its effectiveness in achieving the bill’s stated purposes. * It empowers the DEC commissioner to identify and nominate areas for “dark sky preserves” of the state. * It exempts state agencies, public corporations and electric corporations providing roadway lighting under contract to a public corporation from light trespass restrictions. * It exempts lighting done for security purposes pursuant to regulations of the Public Service Commission, ATM lighting done to comply with the minimum standards of section 75-c of the banking law and historic theater lighting. * It exempts lighting that is furthering an activity found to be a sound agricultural practice under the Right to Farm Law. * It requires the commissioner of DEC in consultation with NYSERDA, the Department of Agriculture and Markets and the Public Service Commission, to promulgate rules and regulations on light trespass. * It requires the commissioner to prepare and distribute a model outdoor lighting ordinance to cities, towns, and villages throughout the state. * It requires the commissioner, in consultation with NYSERDA, to develop and widely disseminate a pamphlet describing the purposes and provisions of this act. EFFECTIVE DATE: This act shall take effect on the first of January next succeeding the date upon which it shall have become law. The members of the Syracuse Astronomical Society (SAS) strongly endorse A7281/S2714, the Healthy, Safe and Energy Efficient Outdoor Lighting Act, which would regulate outdoor lighting in the State for the general benefit of its citizens. Our starry night skies are one of our most precious natural resources, inspiring young and old alike to contemplate the mysteries of the universe. For over a half a century the SAS has reached out to the public here in Central New York to educate neighbors and visitors alike about the marvels of the heavens. Unfortunately, in recent years our view of the cosmos has become increasingly degraded by misdirected and excessive outdoor illumination. Despite the recent forward-looking actions of the Town of Tully in changing over its roadway lighting to full cutoff optics that reduce offensive and distracting glare, save energy, and reduce lighting costs by over 40%, and despite the enactment in 2007 of a town-wide outdoor lighting ordinance (Local Law #7), without decisive action to stem the process of needlessly and destructively lighting up the night elsewhere, the light pollution problem will only worsen. It will not only continue to hamper our ability to bring the wonders of astronomy to others, but it will also continue to degrade the nocturnal environment and to waste precious energy and taxpayer dollars. Therefore, the Syracuse Astronomical Society formally urges all members of the New York State Legislature to act promptly and decisively to pass A7281/S2714, the Healthy, Safe and Energy Efficient Outdoor Lighting Act. If the SAS and its membership can, in any way, be of service in emphasizing the importance of issues raised by A7281/S2714, please do not hesitate to contact myself at (315) 559-4737 or damian@somewhereville.com.